Thanksgiving weekend was definitely a busy one this year!!! Ben and I decided a few months ago that we should drive to Maryland instead of fly. The ticket prices were ridiculous expensive and we couldn't use our frequent flier miles because of black out dates. So.... with the Toyota having a lot of miles already and Ben's car being a hoopty (is that how you spell that?) we decided to rent a car! Tuesday night Ben and I picked up a Dodge Calibur (try not to be too jealous) from Enterprise and headed to SC to spend the night with my parents. 11 hours is a long time in a car and so it was easier to break it up by crashing in Spartanburg at my parent's house. We arrived in Maryland on Wednesday around 5:30pm. We had a few drinks at the house and then headed to Baltimore to meet Kate for dinner. We went to Lebanese Taverna and had a yum meal! Thursday, Thanksgiving morning, was nontraditional in the "stuffing your face sense" but a lot of fun just the same! My sis in law Kate is in her first year of residency and working her little tale off. Needless to say, she was scheduled to work on Thanksgiving day. So we all decided to push back our T-giving meal til Friday evening. Thursday we headed to the Smithsonian Museums in DC. We went to the Botanical Gardens first. Their holiday exhibit is AMAZING! Seriously, you have never seen anything like it! I give it two thumbs up. Def check it out if you live in the area! After the Botanical Garden we headed to the American History Museum. They had just completed the remodeling so we got to see the new Star Spangled Banner exhibit and the New American Wars Section. After the museums we headed back to the Sullivan Pad. We went to the store to buy supplies for the next day's turkey feast and had apps and drinks and then dinner. Friday morning Ben and I woke up bright and early and headed into Baltimore for Breakfast. We had been dying to eat at the Blue Moon Cafe since it had been highlighted on Diners, Drive Ins, and Dives. 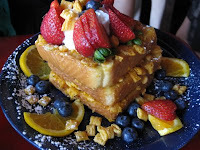 Ben had the Captain Crunch French Toast and it was SOOOOO Yum. I couldn't get over how amazing it was! But beware..it's super sweet so you don't need syrup. After breakfast we walked around the harbor, came home, rested by the fire, cooked dinner, and waited for Kate to arrive. We ate T-giving dinner around 7 and it was so good! I made My mom's dressing which got rave reviews! Saturday Ben and I were on the road early to try to make it home to Spartanburg in time to watch part of the South Carolina vs. Clemson game (wishful thinking since it started at 12pm). But now I'm glad I wasn't there to witness the blood bath. What started as a pretty solid season ended very badly for my gamecocks! Saturday night we hung at the Heatherly house with my mom and dad and sister and brother in law. Sunday morning consisted of Church, visiting the grandma, and sitting in traffic on 85 trying to get back to Atlanta. Ben and I got home right around 6:30, headed straight to the gym, ate dinner and CRASHED! !